Look down over the bright lights and people of the Las Vegas Strip, the shooting, illuminated fountains of Bellagio, andiconic architecture of hotels like Mandalay Bay, Luxor's pyramid, and the Eiffel Tower at Paris Las Vegas. Beyond the city limits, gaze out over the red rocks for a distant look at Mount Charleston, the highest peak in Southern Nevada. With Vegas' clear desert skies, you can see up to 25 miles (40 km) out toward the horizon from the apex of this observation wheel. There are no age, height or weight restrictions. Children ages 3 and under are free with a paying adult. The High Roller is ADA accessible and will stop momentarily to allow for a wheelchair to board. Take on The High Roller, a sky-high adventure that revolves up and around for unmistakeable views of the bright lights and landmarks of the Strip. 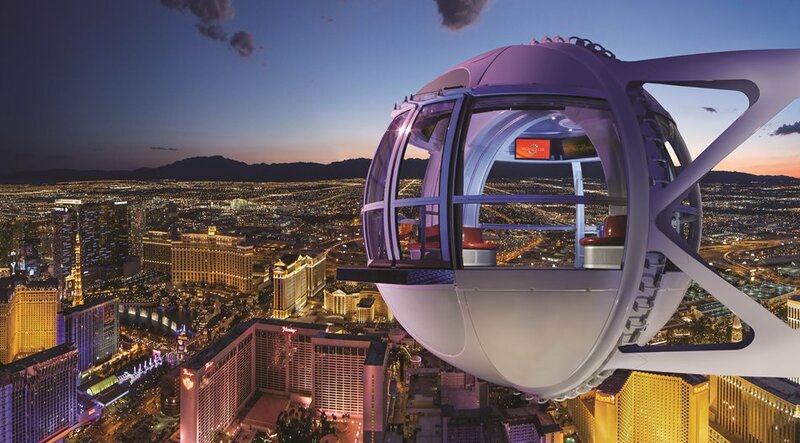 Step into a glass capsule on the world’s tallest observation wheel for a 360-degree look at sprawling downtown Vegas and beyond. Take in the best views of Las Vegas from inside a Happy Half Hour cabin. Your ticket includes one 30-minute ride and an open bar inside the cabin! Happy Half Hour cabins roll daily from NOON-1am, Monday- Sunday. Must be 21 or older to ride in a Happy Half Hour cabin.